The hardest thing I ever did was bring myself out of depression. It came on slowly when I was 18. I’d just lost my grandmother that summer, a woman I’d always looked to for comfort and that special feeling of home. It left me with the uncontrollable sense that a part of me was being ripped away without my permission, and my natural need for control was being tested in a way I’d never experienced before. I cried a lot during those first few months, desperately trying to come to terms with this new twist in my life, but my mind refused to accept it, and I was left in a permanent state of denial. I noticed the physical signs first: the circles under my eyes seemed a bit darker, and my body never wanted to get out of bed. Then my thoughts started getting less and less like my own. I began to hate myself, for this screwed up person I was becoming and the spoiled, unappreciative person I had been. After two years of allowing depression to flatline my life, I got the sudden inspiration to do something about it. I went off the pills I had depended on to get me through the days. They were a crutch, a useless obstacle in the way of my own awakening, and I knew that if I was ever to get myself out of this hole, I was going to have to do it all by myself. Gradually, I got better. My mind became clear, my body was active again, and for the first time in a long while, I felt in control of my own life. I was proud of myself for coming out of something so bleak. I even wrote an article on my experience, and presented it to my peers at an academic conference. My life, my self, was back. And then depression came back: is coming back, and I can’t even begin to face it. I feel so frustrated, so defeated at having to conquer this thing again that I just keep telling myself that if I don’t think about it, it might go away. It’s embarrassing, really. Here I am, the girl who gave a presentation on how to get through depression, and I can’t even muster up the gumption to do it myself again. I stopped cooking, opting to make the same simple dish every night for a week, subsisting off the leftovers in between. I was obsessed with cleaning my apartment, assured that if my surroundings were calm and controlled, maybe my mind would be too. But other times, I get a glimmer of inspiration, however fleeting it might be, and it forces me to actually do something about myself. I started running again, something I’ve always loved but never allowed myself the time to do. I took up yoga, take long bubble baths, and I’m slowly learning to put work down at the end of the day. But I still have a hard time getting myself back into the comfort of my kitchen. I have absolutely no desire to do the one thing I absolutely love doing, and it hurts that I can’t seem to find the willpower to force myself out of this rut and bake some damn cookies. About a week ago, I was browsing through a little tin box of recipes my uncle gave me for graduating. I call them The Vault: dozens of ancient little recipe cards with my grandmother’s signature cursive writing scrawled in between the lines, detailing the ingredients to her favourite dishes. It was the best gift anyone’s ever given me, another link bringing me closer to my grandmother. When I’m sad or lonely, sometimes I bring the two hinged boxes out from their home on my kitchen hutch, and I’ll just smell them, taking in the aromas of my grandmother and her cluttered little kitchen. I came across a recipe for rhubarb upside-down cake among the cards, which was surprisingly coincidental given my dad had rooted up a handful of his homegrown rhubarb stalks and stuffed them in my trunk last time I was home. And so I took out the blue recipe card and started baking. And as I baked, I could picture my grandmother doing the same motions as me, cutting the rhubarb, mixing the sugar sauce and carefully arranging it in a glass baking pan. She was there for me, and for the first time since I lost myself again, I knew that I was going to be okay. Preheat oven to 350 degrees Farhenheit. Melt 1/4 cup butter in saucepan. Stir in brown sugar and orange juice. Mix until smooth, then pour into bottom of baking pan. Chop rhubarb into small slices and wash in colander. 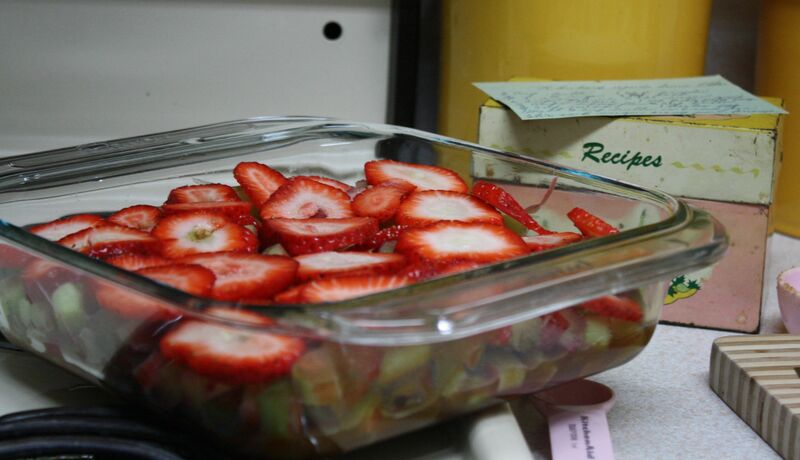 Wash strawberries and cut into thin slices. Arrange rhubarb on top of brown sugar mixture. 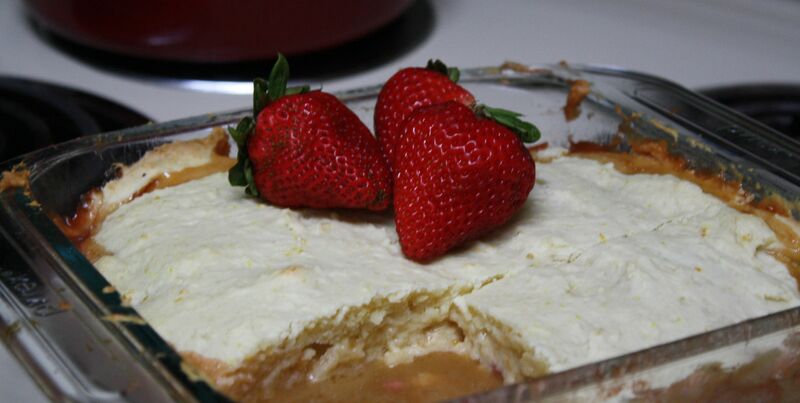 Top with strawberries. Combine flour, baking powder, sugar and salt. Add orange rind and mix again. Cut in 1/3 cup butter until mixture resembles bread crumbs. 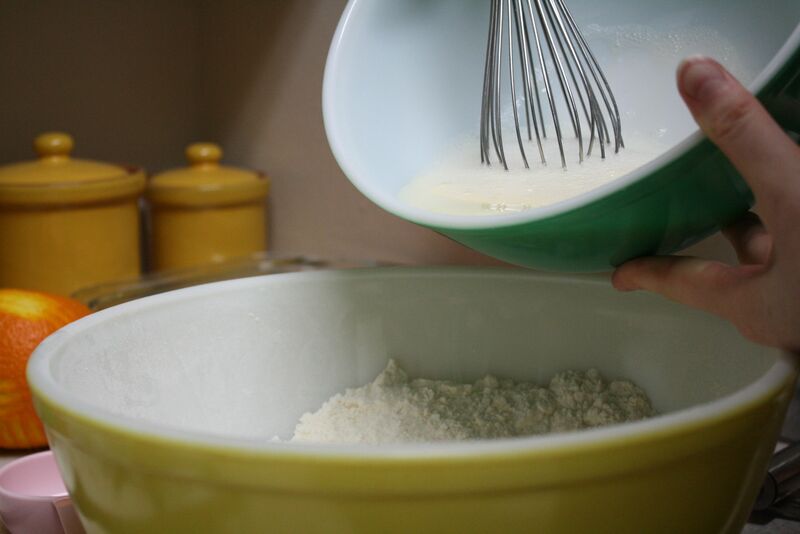 In separate bowl, beat egg and whisk together with milk. Add to flour mixture and stir until combined. Spread batter over rhubarb. Bake until cake springs back when pressed lightly, about 35 minutes. Remove from oven and let cool for five minutes.